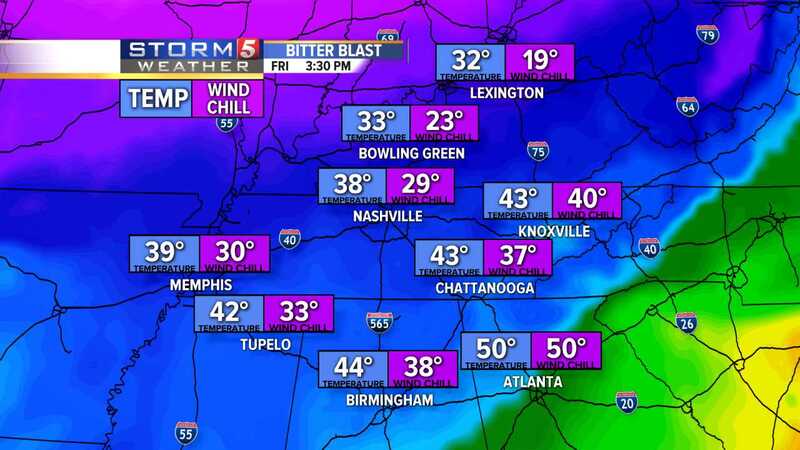 NASHVILLE, Tenn. (WTVF) — Following a week of unseasonably warm temperatures, a strong cold front is pushing more cold air back into Middle Tennessee. After Thursday’s projected record high of 75 degrees – the previous record of 70 degrees was set in 2001 – Friday’s temperatures will struggle to reach 40 degrees. Severe storms moved through the area Wednesday night , prompting tornado and flood warnings. A cold front will move through today and bring more rain and storms. Ahead of the front, a broken line of showers and storms moved through Thursday evening. When the coldest air arrives, moister will be out of the area – aside from a passing snowflake or two. By sunrise Saturday, many areas will dip into the teens to around 20 degrees. However, this latest cold snap will be quick. Temps will be back to near 50 on Sunday and into the mid-to-upper 50s by early next week. Click here for the latest weather updates.